﻿ How to Recover deleted photos from SD card on Mac or Windows? Feature Supports RAW recovery of photos from all major SLR camera. Feature Thumbnail display of recoverable photos, No recovery skills needed. Feature Recovers from various kinds of memory card including; SD card, miniSD, SDHC, MicroSD, microSDHC, microSDXC, XD, CF card, and etc. Recover Deleted Photos from SD Card ? With the expansion of portable media in modern lifestyles, huge things are transformed and are minimized in size to accommodate them. With the minimization of devices equipments used are indulged to more reduction of size. Like the camera’s, earlier these devices were very large in size like big boxes, but now they are even smaller than our palm. The photo film is now replaced by the digital memory storage devices. The digital cameras used these days are very easy to use and handle. This easiness is only due digitization of memory storage space. Otherwise it was complicated to deal with the photo films. SD cards or the secure data cards are used nowadays for memory storage in cameras. The photographs clicked by using that digital camera get stored in sd card. Use of this storage device is quite easy and as the name indicates, secures digital, it keeps the data secured. Basically what this Secure Digital is? It is an amazing device memory storage device having non volatile memory mainly used for portable devices like digital cameras, GPS navigation devices, mobile phones, tablet computers and others. The secure digital standard is prepared and maintained by the Secure Digital Standard Card Association (SDA). There are many types of SD cards specified in many ways according to the physical size of these cards they are specified according to their size or appearance. Mainly these devices are available in three sizes these are mini sd card, micro sd card and sd card. The Micro sized SD card is smallest of them all and is named as microSD, microSDHC, microSDXC. The miniSD card and the microSD card are originally named as TransFlash or TF memory devices, these small cards can be used in larger slots in computer by using the passive adapter. The card names SDHC that means Secure Digital High Capacity, SDXC means Secure Digital eXtended Capacity and the SDIO is the Secure Digital Input Output. These cards are only capable of input output functions in the host devices. SDHC and SDSC cards have some compatibility issues like the redefinition of card-specific data register or CSD register and the fact that SDHC card is preformatted using FAT32 file system. After their mutual compatibility they must be compatible with the operating system on which will be used in future. The host operating systems like Mac (Apple Mac OS X supports SDXC cards, exFAT is supported by Mac OS X Snow Leaopard and the later versions are supported by the OS X Lion), Windows (every version up to windows 7 and 8), windows server 2003 SP2 or SP3 with KB955704 and the Windows CE6.0 and above also support these sd card formats. Speed of data storage in these memory storage devices is also very good. The applications like the video recording in the camcorders and digital cameras requires sustained write throughput and if the device doesn’t perform satisfactory it means that the speed is below desired speed. Similar to USB flash memory card, the SD or secure digital card from the SD family is also block addressable storage device, from where a host device can read, write or edit the fixed size blocks by specifying their block numbers. Different operating system supports different file formats and according to those files formats the specifications of secure digital cards also vary. Like the Mac OS SD cards are partitioned into GUID devices and can be formatted using HFS Plus system of files or can use the eXFAT file system. Beside this risk of reformatting of the storage device is also there. The reformatting of sd card with another file system format or again with the same file format decreases the life span of the sd card. Due to this storage speed is degraded to too much lower grade. Reformatting can lead to loss of data from the storage device. This is very problematic condition when the data from the sd card got lost accidently and finding how to get that back. Earlier it was impossible task to recover the lost data from the sd card but now it is possible. The loss of data mainly depends upon the usage of device. If someone tries to reformat and forcefully use the wrong configuration of device with these memory chips, obviously they will create problem. Many photo recovery software applications are available in the market or online which can help in recovering the lost data. In case of photographs no one wants to make them look bad. Most of the software applications do so. They firstly assure to give optimum output but they are incapable of providing satisfactory results. Very few trustable and tested software applications can get you back your data as it was earlier. One of them is 321Soft USB Flash Recovery for Mac. In Mac it is very difficult to recover photo and files without using the 321Soft USB Flash Recovery for Mac. To get it sorted perfectly follow the steps to recover deleted photos from SD card by using 321Soft USB Flash Recovery for Mac. DO not save any data on that SD card from which you want to recover the photos. Make it sure that the user you are logged in must have the administrator privileges. Don’t try to repair the disk or your SD card by using any disk repair option on your Mac os. Check for sufficient data storage space in the Mac system disk to store the recovered data before launching the 321Soft USB Flash Recovery for Mac. If you are using any portable device to recover the photograph keep sufficient battery-backup for the device for completion of recovery operation. After all these steps are well confirmed by the user, download 321Soft USB Flash Recovery for Mac application and install it on your computer and attach the external SD card to the Mac OS X. 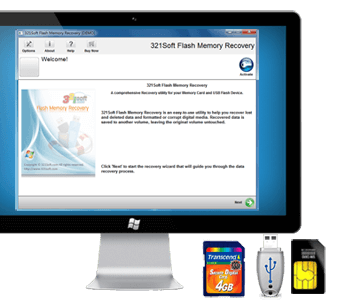 If you are running Windows, you can download the Windows version, 321Soft Flash Memory Recovery. The step-by-step instructions to complete the SD card recovery with USB Flash Recovery for Mac. Launch the application after installation, the wizard will display, now read all the instructions and click on continue button. Now select the file type you want to recover and the manufacturer’s name from the lists given on screen wizard..
Click on next button after selection and select the external disk from which data is to be recovered. Browse the path to the area you want to scan for recovery. After this selects the scenario, three modes will be available on the wizard namely the deleted, formatted and search the lost volumes. Select the appropriate option. After this all the information you had provided to the recovery software will be displayed on the wizard screen, if it is correct then click on continue button. The recovery operation will get started at the moment you select the continue button. When the recovery operation gets completed thumbnails of recovered photographs will display in the wizard. They can be viewed by clicking on them. Recovered files can be stored or transferred anywhere you want to keep them. Discover why 321soft Flash Memory is easy photo recovery software. Ready to Recover Deleted Photos from SD Card? Download the Free version Now! Recover Deleted Photos from SDHC Card? Copyright © 2018 321Soft.com All Rights Reserved.